A team of researchers from the University of Maryland (UMD) and the U.S. Army Research Laboratory (ARL) have devised a groundbreaking “Water-in-Salt” aqueous Lithium ion battery technology that could provide power, efficiency and longevity comparable to today's Lithium-ion batteries, but without the fire risk, poisonous chemicals and environmental hazards of current Lithium batteries. The team of researchers, led by Chunsheng Wang, an associate professor in UMD’s Department of Chemical & Biomolecular Engineering, and Kang Xu, senior research chemist at the Sensor and Electron Devices Directorate of ARL, said their work, published this week in the journal Science, demonstrates a major advance in the long history of water-based (aqueous) batteries by doubling the voltage, or power, of an aqueous battery. The researchers said their technology holds great promise, particularly in applications that involve large energies at kilowatt or megawatt levels, such as electric vehicles, or grid-storage devices for energy harvest systems, and in applications where battery safety and toxicity are primary concerns, such as safe, non-flammable batteries for airplanes, naval vessels or spaceships, and in medical devices like pacemakers. “Through this work we were able to increase the electrochemical window of aqueous electrolyte from less than 1.5 Volts to ~ 3.0 Volts and demonstrated high voltage aqueous full Lithium-ion cell with 2.3 Volts, showing for the first time that aqueous batteries could seriously compete in terms of power and energy density with the non-aqueous lithium-ion batteries that power our mobile, digital lifestyle” said Wang, who also is affiliated with the University of Maryland Energy Research Center and the Maryland NanoCenter. 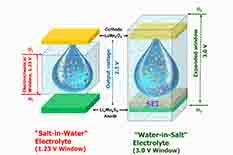 Researchers Wang, Xu and colleagues found that the key to their breakthrough was the use of a type of water-based electrolyte containing ultrahigh concentrations of a carefully selected Lithium salt. This approach transformed the battery’s chemistry, resulting in the formation of a thin protective film on the anode electrode for the very first time in a water-based battery. Known in battery science as a “Solid Electrolyte Interphase (SEI),” such a protective and stabilizing film is essential to the high performance characteristics of state-of-the-art Li-ion batteries. It previously has been achieved only in non-aqueous electrolytes. The UMD & ARL team compared the performance of their new “Water-in-Salt” battery with that of other aqueous battery systems. They showed that high stability of other aqueous batteries was achieved only at the expense of voltage and energy density and vice versa. However, the formation of an anode/electrolyte interphase in their “Water-in-Salt” electrolyte allowed them to break this inverse relationship between cycling stability and high voltage and to achieve both simultaneously. "Researchers in the Li-ion battery field have recently found that previously "useless" solvents could be made functional in Li-ion cells through the addition of high concentrations of salts. The work by Suo et al., extends this idea to the case of the solvent, water. By extending the operational voltage window to approximately 3 Volts, it is possible that a new generation of safer and possibly less expensive Li-ion cells could result,” said Dalhousie University (Nova Scotia) Professor Jeff Dahn, a leading battery researcher, who was not involved in the study. “Only further R&D efforts will be able to verify the practicality of this discovery, so prudence is needed in assessing the potential of this, or any basic research advance,” said Dahn, the NSERC-3M Canada Industrial Research Chair in Materials for Advanced Batteries. “Our finding opens an entirely new avenue to aqueous electrochemical devices, not only batteries, but also devices like supercapacitors and electroplating devices,” said Xu. This research received funding from the Department of Energy, Advanced Research Projects Agency-Energy (ARPA-E) (DEAR0000389) and support from the Maryland NanoCenter and its Nanoscale Imaging Spectroscopy & Properties Laboratory. This UMD lab is supported in part by the National Science Foundation. Modeling efforts were supported by the ARL Enterprise for Multiscale Research of Materials.